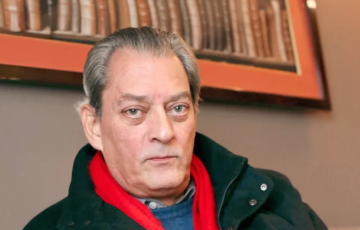 Paul Auster, whose latest novel is “4 3 2 1”, now out in trade paper, in conversation with Richard Wolinsky. The author of several novels, screenplays, books of poetry and film director, Paul Auster’s latest novel is an epic 850 page story of how circumstance changes us. Archie Ferguson takes four different directions in this novel: in one his family has become rich, in another they’re poor, in a third he loses his father in a fire, and in a fourth he remains middle class. With the same genes, each Archie grows up differently. Born in New Jersey in 1947 (as is Paul Auster), Archie is precocious, a writer … the book shows how different developments lead to different outcomes: whether you go left, right, or straight ahead, something might happen that will change your life. In the interview, Paul Auster also talks about his film-making career and about how his life relates to this novel. An extended version of this interview can be found as a Radio Wolinsky podcast. Also: A review of “Heisenberg,” at ACT Geary Theatre through April 8, 2018.